Pickles are having a moment, and as someone who drank the juice from the pickle jar with a straw as a kid (TMI? ), this pleases me. I recently learned about a way to drink pickle juice as an adult that's actually beneficial to your health — and it tastes just like kombucha. 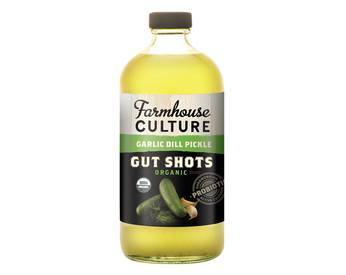 It's called the Garlic Dill Pickle Gut Shot from Farmhouse Culture, a company that makes probiotic-rich snacks and drinks, like chips called Kraut Krisps. When a box of Farmhouse Culture's new drinks landed on my desk, I was intrigued by the Ginger Lemon Gut Punch and other flavors like Strawberry Hibiscus, but I let out an audible gasp when I came across the pickle flavor. A savory, briny, sparkling beverage that's good for your immune system? Yes, please!